Suruchi Restaurant is one of the fine dining restaurants in Faridabad, known for offering lip-smacking vegetarian food and widest varieties of cuisines. The restaurant is running under the flagship brand "Swati Hotels and Restaurants". The interior of the restaurant is simply elegant and exquisitely ornate. In the great ambience of the restaurant, we strive to transform a "dinner-out" into a memorable dining experience. For the sweets and dessert lovers, Suruchi Restaurant puts forward a wide range of mouth-watering delicacies. In addition, our menu also includes Gujarati, Rajasthani and Punjabi thalis for those looking for regional food. 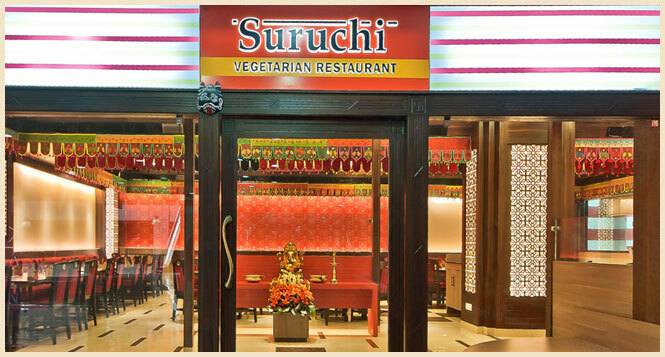 For serving top quality vegetarian food at fair prices Suruchi has earned a reputed name in the hospitality industry. To ensure freshness and quality of food, fresh raw ingredients are delivered to the restaurant daily. Every dish at Suruchi Restaurant in Faridabad is a reflective of a commitment to preserve identity, authenticity and to ensure stirringly sumptuous gastronomic adventure. A team of experienced chefs at Suruchi Restaurant focuses on cooking and presenting the food creatively using an array of herbs and spices to bring you the flavours we grew up on. This perfection and level of quality has brought Suruchi among the best vegetarian restaurants in Faridabad. Apart from offering delicious cuisines the restaurant also serves a variety of snacks to their customers. At Suruchi, one can avail popular snacks like Bhelpuri, Spicy Pakoras, Kachori, Samosa, Aloo Tiki etc. These are excellent options for people who want to have a light meal. These are delicious spicy and mouth watering and tempt people towards them. People visiting there not only have the privilege of tasting the delicious cuisines but tasty snacks. Every dish in Suruchi's menu is cooked to order. Our chefs also take care of maintaining the quality standards and complete hygiene in every dish so the customers can enjoy delicious as well as healthy food. Suruchi Restaurant in Faridabad is an ideal destination to organize parties, corporate lunches and dinners, anniversaries and birthday celebrations. As the best place to dine in Faridabad, we serve fresh food rich in colours, textures and aromas.